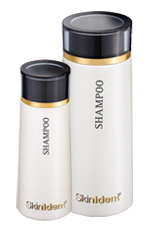 A combination of mild surfactants based on skin and body identical ingredients ensure a protecting hair wash. The Amino acids L-Proline and Hyaluronic acid condition the hair, Panthenol and skin identical Lipids treat the hair and hair roots. For the optimal hair and scalp treatment we recommend the SkinIdent CONDITIONER.